My Deal of the Week is the Motorola Moto X which is on sale starting at $299.99 (reg $399.99) for the 16GB model from Motorola's MotoMaker site through 7/31. All versions of the Moto X are on sale including the unlocked GSM models as well as the Verizon, Sprint, U.S. Cellular and AT&T carrier variants. The 32GB and 64GB Moto X models are also on sale at $324.99 (reg $449.99) for the 32GB and $374.99 (reg $499.99) for the 64GB. 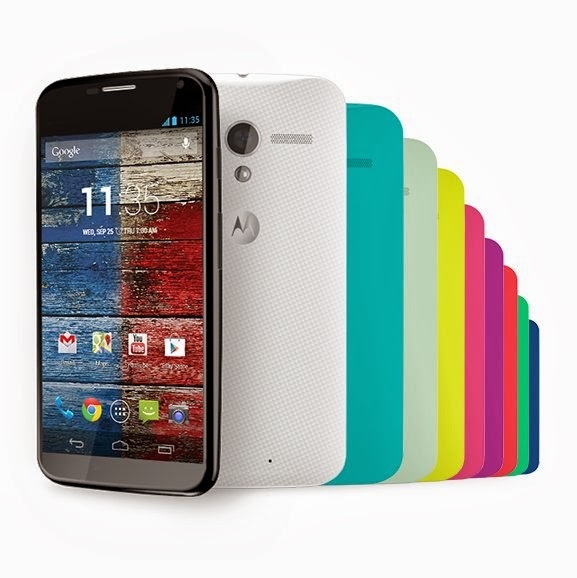 Moto Maker lets you customize your Moto X with a variety of color choices and wallpapers. You can even have a custom message engraved on the back. There's no charge for customization, unless you want a wooden back, which is $25 extra. The Moto X runs Android 4.4 KitKat and has a dual core 1.7 Ghz Krait processor, 2 GB of RAM, 4.7" 720x1280px screen, 10 MP autofocus main camera with flash and a 2MP front camera. It runs a special Google designed version of Android with minimal bloatware and unique features like Touchless Control, which lets you wake the phone with your voice, and Active Display, which lights up the screen to display the time and notifications of missed calls, texts and upcoming calendar events whenever you pick the phone up. Boost Mobile LG Volt $149.99 at ShopCellDeals. Virgin Mobile Samsung Galaxy Victory LTE Android phone with free car charger and case $79.95 (reg $99.99) Free shipping. 50% off Moto X and Droid cases, 25% off screen protectors. 10% off any accessory with code JUSTBECAUSE10 Excludes Google Chromecast, Motorola Shells, JBL Micro Wireless Speaker, Motorola Buds as well as DECK and TRACKS AIR by SOL REPUBLIC x Motorola products. Not valid on Clearance items. Free month of service for new activations only. Purchase a SIM and a 2-month activation pack for the $40 or $50 Unlimited Everything Plan. At checkout enter the code PTBOGOHOLIDAY13 to get a $40 or $50 discount, which makes the 2nd month of the pack free. If you are purchasing a phone you can also use WOOTPTHALF to get a $40 or $50 discount. Straight Talk (online only) Free overnight shipping on phones $29.99 and up. Not all phones available in all markets. Updated 8/1 New Boost Mobile, Cowboom, Frys, Newegg. T-Mobile and Virgin Mobile deals. The Microsoft store has the AT&T Lumia 635 at $99 and the T-Mobile Lumia 635 at $129 is there any difference between these two phones? Also is the AT&T Lumia 635 at the Microsoft store the GoPhone Lumia 635? I believe that the only difference is that one is locked to T-Mobile the other to AT&T. Getting Lumias unlocked is expensive and may not even be possible yet for such a new model. The AT&T 635 in the Microsoft store is the GoPhone one. So are you saying that you think the AT&T 635 supports AWS? Yes, according to AT&T, their 635 version supports LTE on band 4 (AWS) and UTMS/HSPA+ on 1700 Mhz (AWS) See: att.com/shop/wireless/devices/nokia/lumia-635-prepaid.html Click the Details tab and scroll down to Technical Specifications to see the supported bands. Thanks! What a great deal! Why does the T Mobile 635 cost more? Good find, thanks. I've added it to the post. Nice. I'm not sure most people have heard of Univision, but people should know that for all practical purposes, it is a T-Mobile phone and will work out of the box with a T-Mobile SIM. There is absolutely no Univision branding anywhere on the phone aside from the box it comes in. So people can be assured that it is just a T-Mobile phone. Univision plans aren't listed on this site. Do they have roaming? See Updated - Univision and T-Mobile Launch Univision Mobile With Free International Calling for plans. There's no roaming, T-Mobile native network only. you can use Univision phones on T Mobile if you want. No unlock is necessary. Will Univision phones work out of the box with T-Mobile MVNOs? And if they're locked to T-Mobile will Univision unlock them? Yes, Univision phones are locked to T-Mobile They will work on any MVNO that T-Mobile phones work on, which is all of them except for travel SIMs like Lycamobile and Truphone that use their own network code. Can metro pcs phones be used with T-Mobile service? Such as an Metro concord 2 with an T-Mobile sim and service? MetroPCS phones need to be unlocked to work with T-Mobile SIMs. Dennis. Where can you buy the Verizon Moto G for $299? I don't know but the regular price is $99.99. Why would want to pay three times as much? I don't know what changes have been made to the way the website loads today but is was better and faster before. This site is really slow right now. Hit Ctrl-R if loading hangs. There seems to be an issue with one of the servers right now. FreedomPop just sent me an email offering a 'free' 3G/$G cellular modem. I am a customer and already use one of these. @Dennis Bournique: Just out of curiosity: when you are preparing the "Prepaid Phones on Sale This Week" list, how do you discover the Target unadvertised in-store only specials? I visit a local Target store and check the shelf tags. Dennis, it's fantastic that you take the time to visit stores and discover the unadvertised in-store only specials -- not to mention all of the other great specials that you research online. Your weekly list is a wonderful resource for consumers. Thanks for all of your great work. Is it possible to purchase "new" cricket phones at these prices ( without including the MIR) for use as wifi devices/mp3 players, without having to pay for service through them? Or do the terms require that these prices are valid only after certain months of bill payment ? The mail in rebates would kick in only after a few months of service, but even without that, an Moto G at $99 seems like a good deal. You can do it but the Cricket site requires you to pay for the first month's service when buying a phone. Amazon, Newegg, Frys, etc. let you buy MetroPCS phones without paying for service. The list is missing the Walmart Family Mobile OneTouch Evolve Android for $29.88 It works with any T-Mobile MVNO. That's an online price and the phone is out of stock online and not eligible to order online for in-store pickup. Do Walmart stores honor online prices? The Walmart site says they may not. I don't know about that but it's the same price in store and is in stock. T-Mobile Nokia Lumia 635 $110 on eBay. Is it true the Cricket Lumia 1320 won't support LTE on T-Mobile even after it's unlocked? Yes, The Lumia 1320 does support T-Mobile bands but there is a post on this site saying Cricket has locked the hardware so data only works on the AT&T network even if it's SIM unlocked. Can they do that? What do you mean by Lumia phones aren't easy to unlock. How is it different from unlocking other phones? Unlocking is actually easy, if you use the phone on Cricket for 4 months they will unlock it for free. If you don't want to wait or give Cricket your money you need to use an unlocking service. The biggest, best known (and most expensive) service, cellunlocker.net says they can't currently unlock any Cricket Lumias. Other services like unlockthatpnone.com and unlockcode247.com don't list any Cricket Lumias on their sites but ask you to contact them for information on unlocking unlisted phones. For Lumias that can be unlocked the price ranges from $20 to $42, with 2 week turn around time. A user posted it on the Cricket launches Lumia 630 page on this site. The post says LTE and HSPA won't work on T-Mobile. If the APN settings are locked doesn't that mean that any data won't work on T-Mobile as well as AT&T MVNOs? 2 week turn around? Do you mean I have to send them the phone to unlock it? If the APN settings are locked then data and MMS probably won't work on any operator or MVNO except Cricket unless the phone can be debranded. You don't have to send the phone to the unlocker but it takes them 2 weeks to get the unlock code and send it to you. I think they have to get the codes from someone at Nokia and maybe there's a queue. Even T-Mobile and AT&T sometimes make you wait for codes while they get them from Nokia. Do you know if Cricket locks the APN settings on all of their phones? I'm sure Cricket doesn't lock the APN settings for all there phones. I'm not even sure they lock them for ANY phones. The "locked APN" idea started when you or another anonymous commenter wrote that "there is a post on this site saying Cricket has locked the hardware so data only works on the AT&T network even if it's SIM unlocked". I took that to mean that the APN settings were locked. It turns out that the post was actually a single anonymous comment on another post saying: "...if you are trying to unlock the L1320 for use on T-Mobile it won't support 4G LTE and it won't support 4G HSPA+ except for refarmed areas. AT&T locked down the hardware on the L1320 for it's network only". That statement doesn't say the APN settings are locked. If they were HSPA+ wouldn't work, even in refarmed areas, because you have to use T-Mobile APN settings to get ANY data, even 2G on T-Mobile. If the APN settings can be changed to T-Mobile's (and they have to be to any data) then T-Mobile's band 4 LTE should work unless Cricket somehow disabled the ability to switch to LTE mode unless a Cricket SIM was present. Until someone manages to get a Lumia 1320 unlocked and tries to use it on T-Mobile it's all conjecture. If you want to try, go for it. But I wouldn't buy a just released $200 Cricket phone and expect it to be fully functional on T-Mobile without considerable sweat and tears, if at all. I agree with you. It doesn't sound like the APN settings are locked at all. I asked about the post that says "AT&T locked down the hardware on the L1320 for it's network only"
What does that mean? How is the hardware locked?